Useful for people with limited eye-sight. Enlarges fine print to 4X itsoriginal size. 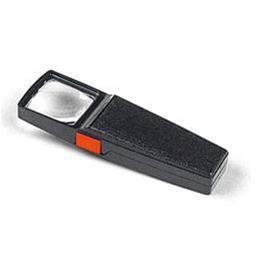 It is a high quality magnifier with a 1 1/4¨ (3.2 cm)square unbreakable clear lens and a sharp focused flashlight. Operateson two AAA batteries (supplied). Bulb is activated only when thumbswitch is depressed.